Spokesperson vows Hamas terrorists will renew activities in Judea-Samaria cities after arson, calls for suicide 'revenge' bombings. The Hamas terrorist organization called for attacks against IDF soldiers and "settlers" last Friday shortly after an Arab infant was killed in an arson attack at the village of Duma in Samaria, but now the group is stepping up its incitement and demanding that suicide bombings be deployed. The IDF has indicated Jewish extremists may possibly have been behind the arson, given the presence of Hebrew graffiti at the site, and that pronouncement has sparked a cavalcade of condemnation by Israeli and international politicians against "Jewish terror" - which was followed quickly by Arab calls for terrorism that were answered by a wave of attacks. Hamad Al-Rakav, a senior Hamas leader in Gaza's Khan Younis, said that residents of "the West Bank and occupied Jerusalem" need to attack not only Israel, but also the Palestinian Authority (PA) Security Forces who are "traitors and collaborators." 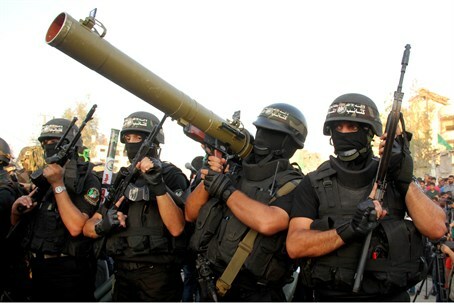 Hamas has long demanded that the PA drop its security collaboration with the IDF. According to Al-Rakav, Hamas's "armed wing," the Al-Qassam Brigades, will renew its activities in cities around Judea and Samaria and attack Jews in "revenge" for the lethal arson, despite the fact that the identity of the culprits remains unknown. "The Zionists' burning of the helpless infant that didn't commit any crime is proof that they are thirsty to spill our blood and to commit crimes against our people," claimed the Hamas leader. Calling for "revenge," Al-Rakav emphasized that the response required is a return to suicide bombing attacks. In parallel to calling for attacks against Israel, Hamas has used the opportunity of the arson to attack its rival PA, with a spokesperson accusing PA Chairman Mahmoud Abbas of bearing personal responsibility.